"If human rights were really important to the activists on the Estelle, they would sail to Syria," says Prime Minister. Prime Minister Binyamin Netanyahu, praised the IDF Saturday for its interception of the Estelle, a ship that tried to run the blockade of the Hamas-controlled terror mini-state of Gaza. 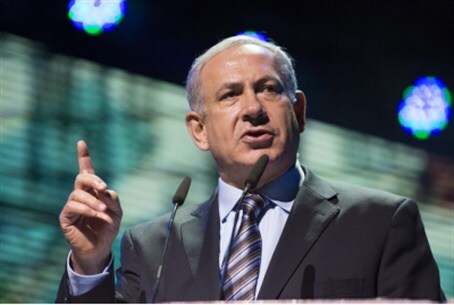 "Even the people who were on the ship know that there is no humanitarian crisis in Gaza," Netanyahu said. "Their entire objective was to create a provocation and blacken Israel's name." "If human rights were really important to these activists, they would sail to Syria. We will continue to take strong and determined action to defend our borders," the Prime Minister said. "There was no violence," a military spokeswoman said Saturday after troops had taken control of the 53-meter (174-foot) vessel. "The passengers did not resist." The activists on the ship were trying to create the impression that Gaza is impoverished and requires humanitarian aid because of the IDF blockade. In fact, however, the only reason for the blockade is that Gaza serves as a haven for terrorists who are always attempting to smuggle in arms by sea. Israel also supplies Gaza with water and electricity, despite calls by some in Israel to cut off this supply. Since March of 2011, the Syrian regime is engaged in a murderous war against its own citizens. Estimates of deaths in the civil war vary between 28,000 and 37,355. UNICEF reported that over 500 children have been killed by early February 2012. Another 400 children have been reportedly arrested and tortured in Syrian prisons.